Hit That Note Inc. Music Studio - Bolton Ontario - Hit That Gym! The benefit of a personal trainer, at a fraction of the cost. Conveniently held onsite. First session is FREE! 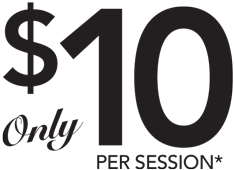 *Based on purchase of 12 sessions ($120 + hst); no contracts; no expiry; interchangeable. Pay-as-you-go is $15. Cheque or cash only. Signed waiver required. Min. age: 14 years. Carla D'Angelo has 30 years experience as a Health and Wellness Fitness Specialist, she brings forth a plethora of expertise in the fitness industry. Carla teaches Bootcamp and Cardio Step Classes to a variety of ages and also teaches Muscle Conditioning and Aquafit classes. She has managed large scale fitness facilities and coordinated fitness schedules to multiple fitness establishments. Carla has been a Yoga instructor for 20 years and is passionate about helping people achieve a balance between their mind, body and soul. Carla invites you to join her in discovering all that yoga has to offer you. Namaste.